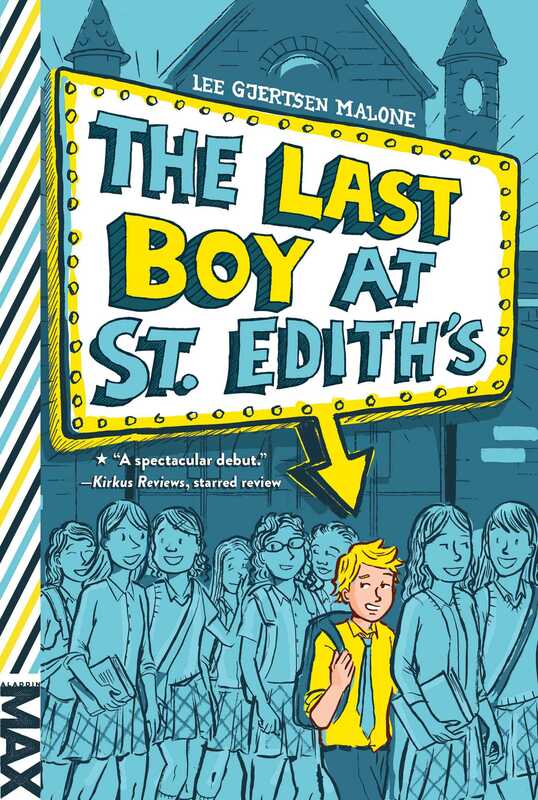 A seventh grade prankster is determined to escape the all-girls academy where he’s the only boy—by getting expelled—in this “spectacular debut” (Kirkus Reviews) MAX novel that’s perfect for “fans of Jerry Spinelli’s Crash and Loser” (Booklist). Seventh grader Jeremy Miner has a girl problem. Or, more accurately, a girls problem. 475 of them to be exact. That’s how many girls attend his school, St. Edith’s Academy. Jeremy is the only boy left after the school’s brief experiment in co-education. And he needs to get out. His mother—a teacher at the school—won’t let him transfer, so Jeremy takes matters into his own hands: he’s going to get expelled. Together with his best friend Claudia, Jeremy unleashes a series of hilarious pranks in hopes that he’ll get kicked out with minimal damage to his permanent record. But when his stunts start to backfire, Jeremy has to decide how far he’s willing to go and whom he’s willing to knock down to get out the door. IT WAS THE THIRD DAY of the ninth week of school when Jeremy Miner decided to get kicked out of seventh grade. He’d been sitting on a school bus waiting to go to MacArthur Prep to cheer on his sister Rachel and the rest of the St. Edith’s championship volleyball team. He’d been late, one of the last people on the bus, which meant he had to sit up front behind Mr. Reynolds. Jeremy probably should have liked Mr. Reynolds more than he did. Reynolds was the language arts teacher, and Jeremy loved to read, not to mention he was the only male teacher at the school and the faculty advisor of the Film Club, Jeremy’s favorite after-school activity. But there was something irritating about Reynolds. Maybe it was the fussy way he laid his finger next to his mouth when he was listening to a student, or how he called Jeremy “Mr. Miner” with such overpronounced emphasis on the “Mr.” that the girls in the back of the class would titter. The driver was starting to close the door when Claudia darted onto the bus and slid into the seat next to Jeremy, the yard of ball chain wrapped around her neck and wrists looking like armor in contrast to the shredded pink tights she wore under her plaid skirt. “Did you hear?” she hissed. Jeremy hadn’t particularly liked Andrew—nobody did—he brushed his teeth only about once a week, for one, and he talked about the Boston Red Sox far more than any one person should ever talk about anything. Andrew was the kind of guy Jeremy’s mom always said he should “make an effort with” and “try to get to know better.” But Jeremy figured that probably meant spending more time with Andrew, and since the time they spent together as the sole members of the boys’ tennis team was already pretty tedious, he couldn’t see how hanging out even more would improve things. But Andrew did have one redeeming quality—he was male. Because Jeremy had a girl problem. Or, more accurately, a girls problem. Four hundred and seventy-five of them, including his older sister, Rachel, who was in the eighth grade, and his younger sister, Jane, who was in fourth. That’s how many girls went to St. Edith’s Academy. At home it was just his mom and his sisters. Jeremy’s dad was off saving the oceans in his solar-powered research boat. And now the only other boy in school had thrown in the towel, a day Jeremy had dreaded for two whole years. Jeremy had a list, buried deep in his desk drawer at home. Twenty-six names. A list of all the boys who had attended St. Edith’s. He’d made it in fifth grade, when they’d all pledged to transfer or get kicked out. He’d vowed not to be the last one. Over the years he’d added a number to each of their names as they left, counting down, one by one, from twenty-six, every time swearing he would be next. But now his list was down to number two, Andrew Marks. And there was only one name left: Jeremy’s. It was never supposed to come to this. He’d always hoped that his mom would let him transfer, or that some of the other boys would hang on until the end of eighth grade. Being one of a few boys, even if he didn’t especially like any of them, was manageable. Being the only boy was something else entirely. St. Edith’s was what you might call a failed experiment. Founded in 1879 as an all-girls school—the words ACADEMY FOR GIRLS were still carved in the limestone above the imposing front doors—but faced with declining admissions, the board of trustees had decided to start admitting boys right before Jeremy was old enough for first grade. But few boys ever wanted to attend. The school had a long-standing reputation as a staid and chaste academy for girls that no amount of rebranding could change. And the failure to attract male students meant boys’ sports suffered, which made it even harder to convince boys to come. In a last-ditch effort, the trustees added a football team as a way to attract boys who wanted to play but perhaps would not have made the team at other, more sports-savvy schools. The problem was a football team needed thirty or forty kids to be really viable, and there were only fifty-two boys in the whole school, with only about twenty old enough to play. So, in a controversial move that was infamous in the annals of western Massachusetts private schools, the trustees decided to make football mandatory. Mandatory football was a disaster right from the start. They didn’t call it that, of course. They called it “Fulfilling the physical education requirement through team sport,” and they made all the girls play on teams too, to make it fair. But it basically meant mandatory football for all the boys in seventh and eighth grade. The football coach was Ms. Brewster, who also coached the badminton and lacrosse teams and seemed to think the only differences in football were the shape of the ball and a little bit of tackling. This was a catastrophic error, as seen in the team’s first game against coed MacArthur Prep. Tiny seventy-five-pound seventh graders were crushed by onrushing linebackers. A boy who had never run for anything, not even a bus, collapsed, wheezing, in the end zone. And James McPhee, whose family had emigrated from Ireland and who was under the impression he was learning to play a slightly more physical version of soccer, saw the line of broad-shouldered players from the other team steaming down the field toward him, turned, and ran off, never to be heard from again. Their team name—the Amazons—didn’t help either. Jeremy was only in fourth grade at the time, so he wasn’t forced to play. Instead he stood dumbly on the sidelines, holding his embarrassing French horn, and prayed they would cancel mandatory football before he was old enough to join the team. Boys complained and convinced their parents to transfer them to one of the many other successful coed or all-boys schools in the area, and a few short years after it first added boys, right before Jeremy started fifth grade, St. Edith’s gave up and went back to being all-girls. The school would allow the existing boys who attended to continue on and graduate but would admit no more. Prep Confidential—the private-school insider blog all students read religiously—had a field day. The parents and teachers—including the newly installed post-football-debacle director, Ms. Powell—said not to take what the Con wrote so seriously. Of course, it wasn’t the only thing that was important, not by a long shot, and every time the Con wrote about St. Edith’s, enrollment fell and more students transferred. Especially boys. In fact, right after the decision to go back to all-girls status there had been a mass exodus of almost every remaining male, except for a hardy few who, by fate or circumstance, were forced to remain: Jeremy’s list of twenty-six. It had been pointless to hope that these same souls would hang on until graduation. The truth had been dawning since the first day of school when Jeremy discovered that over the summer even Carson Johnson and Elijah Rosen (number three and number four, respectively) had both transferred, leaving just Jeremy and smelly Andrew Marks. She had a point. Even back when there were a couple dozen boys in the school, he had mainly hung out with Claudia and her crowd. Really, he hadn’t had a guy friend since fifth grade, when Miles Portman (number twenty) moved to Minnesota. But somehow it was different when they were younger. Hanging out with only girls wasn’t a problem when they were still little kids. It was only lately he’d really begun to notice. “A buffer zone?” Claudia asked with a quizzical look. “But not here,” Jeremy always grumbled. It was a constant reminder he didn’t belong at St. Edith’s, learning a sport most people played in skirts. What people like Claudia didn’t understand was that all he really wanted was to be a regular guy, someone who fit in. She gave him a sympathetic shrug, but even she didn’t have an answer. A few moments later the bus turned down the long drive leading to the impressive facade of MacArthur Prep, the fiercest rival of St. Edith’s. Well, in girls’ sports. Because unlike Jeremy’s school, MacArthur was coed. And events at coed schools were always the worst. But he had to go to the game; his sister was the star of the team. The financial aid director at St. Edith’s had already confided in Jeremy’s mom that she expected “lots of interest” from high schools who wanted a student like Rachel, with top-notch grades and the potential to be all-American in volleyball and field hockey. And lots of interest meant lots of scholarships, which was the only way Rachel would get to go to any of those places, Jeremy knew. As they made their way into the gym and onto the bleachers, he stayed deep within a gang of St. Edith’s girls. Once Reynolds and the other teachers were distracted, he slipped off his telltale baby-blue-and-pale-yellow plaid school tie and stuffed it into his pocket. Not that he’d be getting up at all during the game—he knew better than to leave his seat. The last time he got up at one of Rachel’s volleyball games, last year, he and David Somers (number eleven) had been cornered by a couple of kids in the bathroom who told them they should be using the girls’ room instead and, for good measure, escorted David down the hall and stuck his face in one of the girls’ toilets. He transferred out two days later. This time Jeremy went in with a plan: Lie low, stay in the middle of the pack, and attract as little attention as possible. And it seemed to work. At least until the third set. “Hey, look,” a boy’s voice called from a few rows away. “Is it just me, or are the St. Edith’s girls getting uglier? That one looks like a dude.” It was one of the MacArthur Prep boys, and his voice was loud enough that everyone in their section looked over. Too loud, really, to be anything but trouble. “Ha-ha, you’re hilarious,” Claudia said in the direction of the voice. The speaker was sitting with a whole gang of boys, all wearing the same sharp-looking navy blazers and gray pants that marked them as going to MacArthur and made Jeremy glad he’d taken off his ugly pastel tie. He poked Claudia with his elbow to get her to shut up and pretended to be completely captivated by the action on the volleyball court. But he heard rustling and grumbling down the row as the loud boy shoved his way past the plaid-covered St. Edith’s knees and squeezed in right between Jeremy and Claudia. He threw a large arm around Jeremy’s shoulders, like they were friends, but the weight of it sent a current of panic down Jeremy’s spine. Jeremy laughed like the kid was joking, even though he clearly wasn’t. Around him the girls tittered into their hands and moved away, all except Claudia, who was widening her eyes at Jeremy like she was trying to communicate with him telepathically. There was some grumbling from the girls and another pointed look from Claudia. Jeremy felt ill. Attracting attention at a place like this was the last thing he wanted. Jeremy winced. It’s not like he actually wanted a girlfriend; he had enough problems dealing with girls just as friends and classmates. But it wasn’t the sort of thing you wanted someone to say out loud in front of half the school. “I bet you’re too busy painting your toenails and watching, like, Frozen with your lady friends,” the boy continued with an ugly little smile at Claudia, who looked like she was holding her breath to keep from exploding. Jeremy wasn’t sure if it was because she was aching to defend her friend against this bully or because he had accused her of liking a Disney film. And now the boy was looking at him like he expected Jeremy to say something back. Jeremy gulped. He had no idea how to respond to a guy like this. It was cold in the gym, but sweat formed on the back of Jeremy’s neck as the boy kept smiling at him in a really unfriendly way. Jeremy could think of a million wrong things to say but nothing that could possibly make this boy leave him alone. And the seconds ticked by. “Hey!” Jeremy said, even though he was still trying to force his breathing back to normal. He knew the boy wouldn’t have done anything really bad with all the teachers around, but he was still rattled. It was always like this with boys who went to normal schools. The next two years spread out ahead of him, a series of unrelenting humiliations. No more boys’ teams to play on. The only boy in yellow and baby blue at sporting events. The only boy on their side of the gym at those ridiculous dances his friends claimed were lame but always wanted to attend. The only boy at graduation, the only boy at every party and in every class play. The only boy, anywhere and everywhere, standing out like a sore thumb. For what felt like the rest of his life. And the worst part was, lately he was beginning to wonder what it meant to be, if not a man, then a guy who was going to be one someday. How did you even figure that out when you were surrounded by girls all the time? From movies? Even an orphan like Luke Skywalker had Uncle Owen to look up to. As for real life, he wasn’t clueless enough to aspire to be like the guys at MacArthur Prep, but it wasn’t like he had any other alternatives—even if he wanted to be a sensitive guy, how would he learn? His sensitive dad had skipped out years ago without leaving anything like a guidebook behind. “Okay. I get it. Your life stinks. So what do you plan to do about it?” Claudia asked. Lee Gjertsen Malone is a Massachusetts transplant via Long Island, Brooklyn, and Ithaca, New York. As a journalist she’s written about everything from wedding planning to the banking crisis to how to build your own homemade camera satellite. Her interests include amateur cheese making, traveling, associating with animals, shushing people in movie theaters, kickboxing, and blinking very rapidly for no reason. She lives in Cambridge, Massachusetts, with her husband, daughter, and a rotating cast of pets.